I've somehow collected quite a bit of foundation and I'm not sure what happened. I was pretty good for awhile and only had 2-3 on hand for when the seasons changed or when I wanted a specific finish. I only have one face and so I definitely need to cut back. Some of them have also expired and so those definitely need to be dealt with. Oh yeah, I should probably address the variance in coloring and what I match. I'm about a MAC NC35, but with more yellow tones. 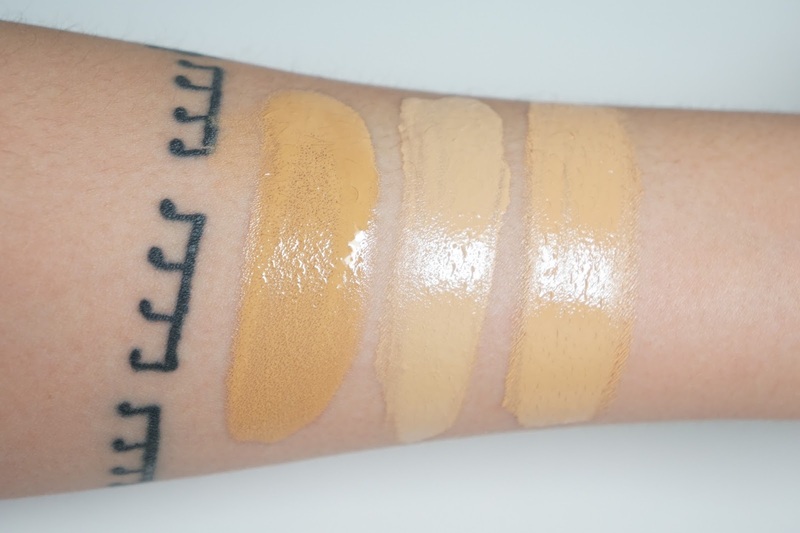 I have the Pro Longwear Concealer in NC35 and it's a bit too beige to be a perfect match. My best match is probably between the L'oreal Infallible Pro-Matte Foundation in 105 Natural Beige and the Bourjois Healthy Mix Foundation in 54 Beige. I tend to buy foundations a bit lighter because it's easier to adjust them darker than to adjust it lighter but I also apparently play it risky and buy foundations online. The first of the three that I'm definitely getting rid of is the NARS All Day Luminous Weightless Foundation in Barcelona. It kind of hurts me that I'm throwing it away, but I can't return it and it's kind of old now so I don't want to sell it. The color is also too dark and I could never make it work on my face. I really did give it a good try, but it would only look good for a few hours and then break down. The Makeup Forever HD Foundation in 127 is also old. It's the original formula that I initially loved but now it doesn't work that well with my skin anymore. The Illamasqua Rich Liquid Foundation in 233 was something I bought from Hautelook for about $10 awhile back and so I'm not hurting as much by throwing this away. The foundation feels and looks really thick on my skin and so I'm just going to toss it. 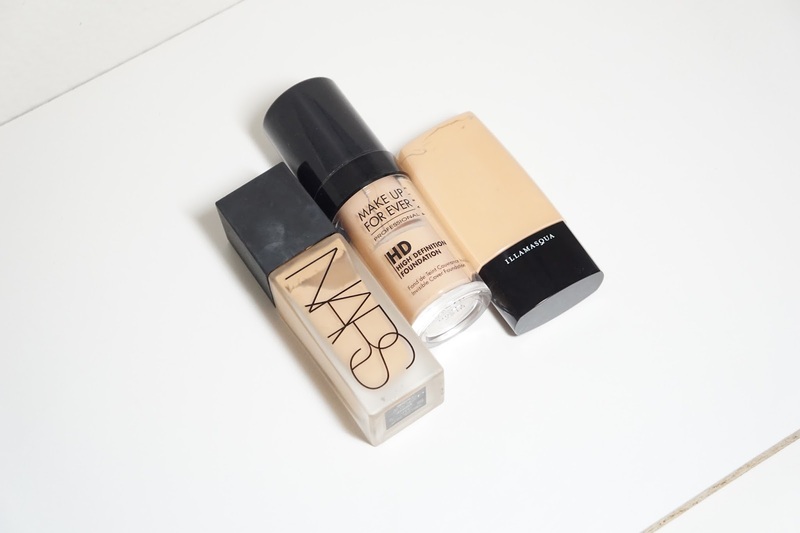 The below foundations are the ones I'm hesitant on either throwing away or keeping. I'm going to be wearing them for the next few weeks to decide though! 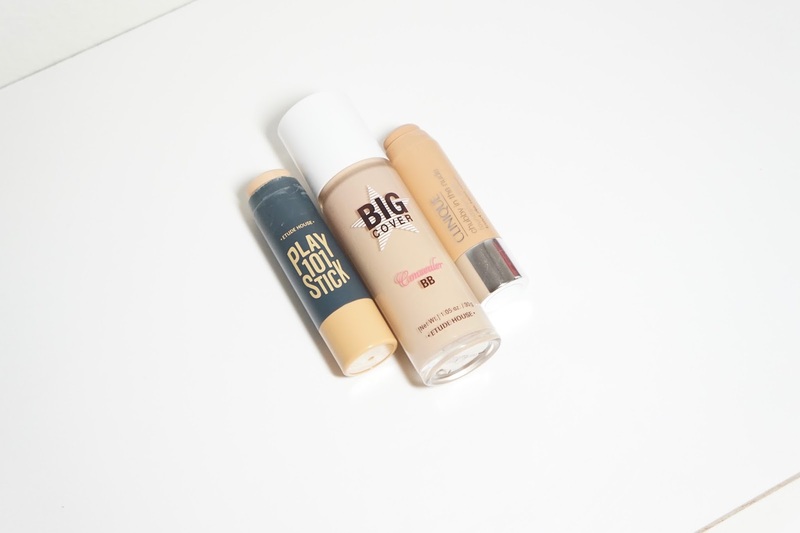 The Etude House Play 101 Stick Foundation in #4 Sand* and Big Cover Concealer BB in #23 Sand* are both too light for me, but I can make them work by putting them in the center of my face. I also started using the Concealer BB as an under eye concealer and it's been working really well. I should throw these away to make room in my collection, but I actually do like the finish and look of these on my face. I'm going to keep these for now, but I will really need to re-evaluate when my collection is getting massive again. 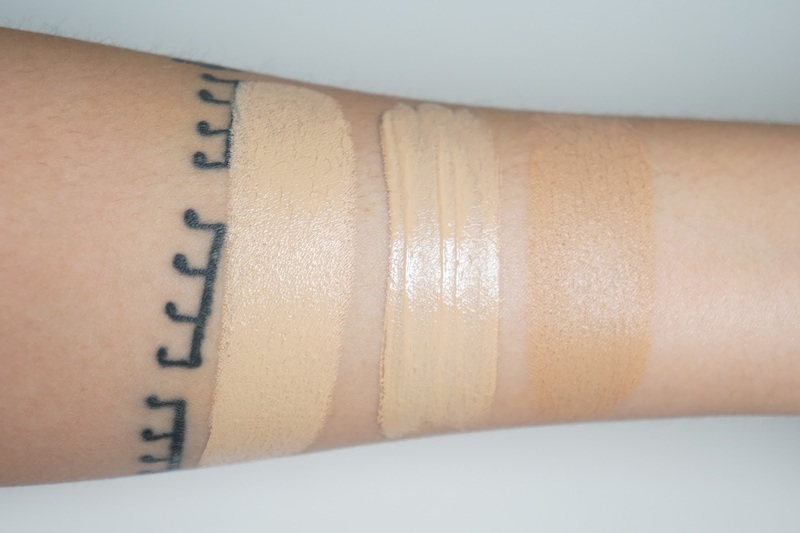 I like the Clinique Chubby Foundation Stick in 09 'Normous Neutral and the color is a better match but I kind of like the other foundations I'm definitely keeping more. There's nothing bad about it, but it's just not as great as some others I have. It's so small though and so I might just toss it in a travel makeup bag for my weekend trips. I actually should've put the Illamasqua Skin Base Foundation in 10 in my "Maybe" pile but I'm going to keep it for now. This foundation does look nice in photos and for errand kind of days, but it does make me look oily after a few hours and not in a "I'm so healthy and dewy!" kind of way. Ahhh, the L'oreal Infallible Pro Matte Foundation in 105 Natural Beige. It looks gorgeous and and leaves a beautiful natural matte finish, but I just need to remember to put on either 2 layers or layer with another foundation because my cheeks will just eat it up. The Bourjois Healthy Mix Foundation in 54 Beige is also another foundation that leaves a beautiful finish, but it's more on the dewy side. It's also getting old, but I can't part with this. Besides the finish, it's also hard to get it in the US. The Makeup Forever Ultra HD Foundation Stick in 127=Y335 is highly raved about and for good reason. It looks great in person and also on camera. It blends in easily and has pretty decent coverage, but I still need to do some concealing. The last product for this post is the Cover FX Custom Cover Drops in G40! I'm almost done with this bottle, but this product will forever be in my collection. 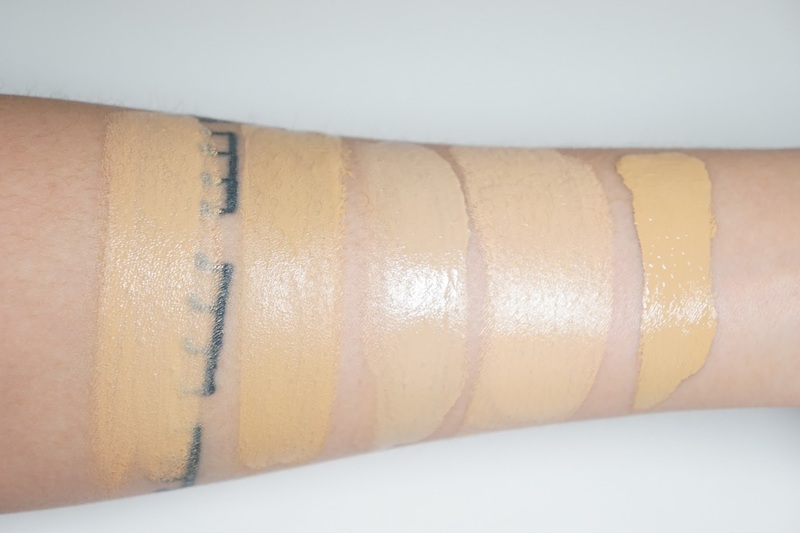 I use it to help adjust any too light or not yellow enough foundations and to also bump up the coverage of any foundation. I can't praise this product enough and I also now have a backup due to winning a Cover FX giveaway on Instagram. & that's it for this post! 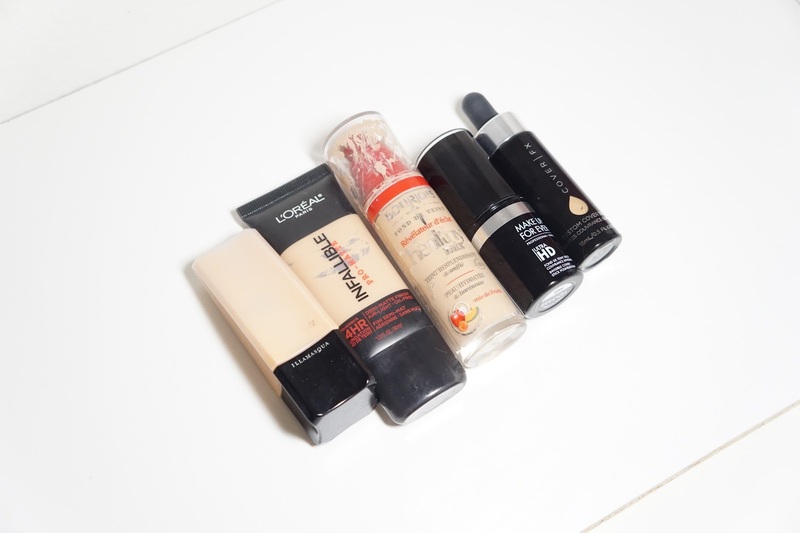 Even though throwing away 3 foundations isn't a lot, it's a start! Hopefully I'll be able to clear out more of my collection, but it'll be a slow process. What foundations are permanent staples in your collection? 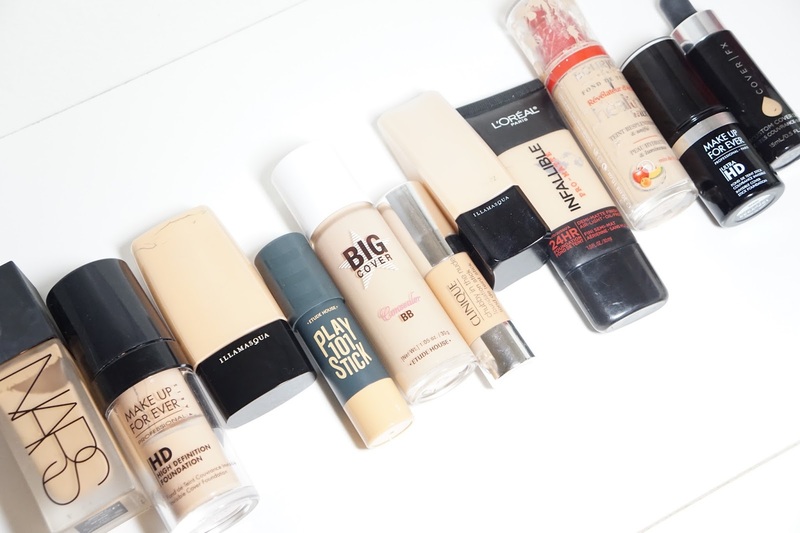 What is your criteria for a good foundation? *I received these Etude House foundations as PR samples through their Pink Bird program. All opinions about these products are my own and I was not paid to say anything.